Now, in early-2001, house once again forms the basis of his sets, though he's just as comfortable spinning breaks-based sounds. The “Thinking man” tag that’s sometimes attached to DJ Chewie’s sets in no way takes away from the inherent danceability of his track selection. And by Taipei clubland standards, the vinyl in his bag offen the very definition of fresh. When he's not DJing, Jim Lee organizes club nights and one-off gigs in Taipei clubs. 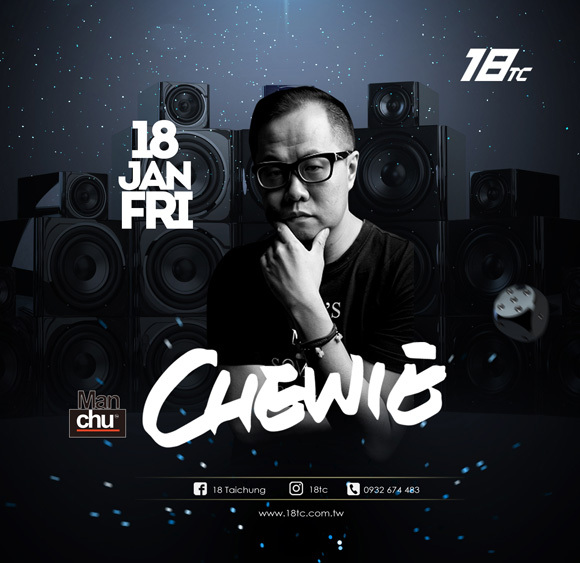 DJs he's brought to Taiwan as event organizer with AB Koo and Manchu Productions include Sasha, Lee Burridge, James Zabiela, Adam Freeland, Phil K, Tayo, Mo Shic, Steve Gerrard, DJ Hyper, Dan F, Evil 9, Jonathan Lisle, Luke Chable and Matrix.